When I was growing up, turnip greens were regularly included in our meals, and I always remember the bowl of greens on the table with a vinegar cruet nearby. A typical Southern preparation includes bacon, onions, and some type of vinegar, and we would drizzle a little more vinegar on top when serving. Now that I have children of my own, I’ve discovered this is one green that I can actually get them to eat. Sometimes. 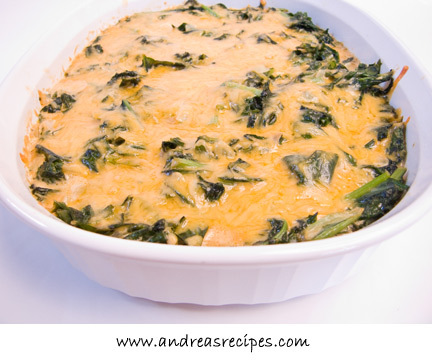 This particular dish is a variation on creamed spinach, a comfort food for an autumn day. The primary difference between the spinach and turnip greens version is the sauteing time. I can usually saute spinach for just a few minutes before baking, but even young turnip greens take up to 30 minutes before they are tender enough for baking. If your greens are fully grown and on the tough side, you may need to saute them longer before baking. Turnip greens can be downright chewy and bitter if harvested late, so choose young tender leaves for the best texture and flavor. Some varieties are grown specifically for the tender greens, such as Seven Top and Topper. You can plant turnip greens twice a year, in early spring and late summer, and we have some growing in the garden now. Next spring we plan to have more raised beds so we can grow more of our own greens. Like many greens, turnip greens rate very highly on the health food scale, with plenty of vitamins K, A, C, B6, and E, as well as various important minerals. I can’t say that adding cheese and cream makes them healthier, ahem, but for an occasional indulgence, this is a tasty way to enjoy them. 2. Melt the butter in the pot over medium heat. Saute the onions and garlic until they are soft and translucent. Add the mushrooms and saute until they soften and glisten, about 3 minutes. Sprinkle the paprika over the vegetables and stir. 3. Add the turnip greens a few handfuls at a time, stirring as you go, until all the greens are in the pot. Once they have cooked down a bit, season with a little salt and pepper. Cover and continue cooking until the greens are tender, 20 to 30 minutes. If the greens were older, you may need to cook them for up to 60 minutes. Taste one to make sure you have the desired tenderness before adding the cream. 4. Stir in the cream or half & half, and bring to a boil. Reduce to a simmer, and cook until it has thickened, about 5 minutes or so. 5. Pour the greens into the baking dish and sprinkle the grated cheese on top. 6. Bake in the preheated oven for 5 to 10 minutes, until the cheese is bubbly. Remove from the oven and allow to cool for a few minutes serving. This is definitely going on my “must try” list, loks delicious! Whoops that should say looks delicious! ok I had no idea about 99% of this! of f to download your blogher presentation! I’m having a holiday party here in Vegas, and I’m featuring recipes and ingredients from back home in Kentucky. I’m thinking about making these (with frozen turnip greens, unfortuantely) and using them to stuff hollowed-out roasted new potatoes to serve with country ham. Whaddya think?